Can a Felon Become a School Teacher? Some felons may have enjoyed helping others in prison by instructing them and thought of becoming a teacher after their release. There are resources available for felons to start a new career as many employers have found that felons make good employees. 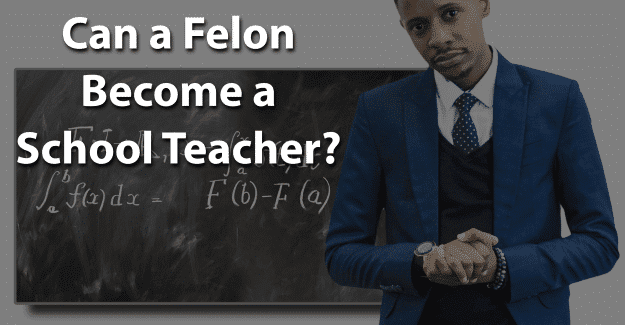 This blog post will address the issue of whether or not a felon can become a school teacher. What Education/Training Does a School Teacher Need? How Much Does a School Teacher Earn? All states require public school teachers to have at least a bachelor’s degree, usually in a subject area, such as science or history. Private school teachers do not need to meet state educational requirements, but they typically have a bachelor’s degree. All states require teachers in public schools to be licensed or certified for a specific grade level. Those who teach in private schools typically are not required to be licensed. In teacher education classes, students learn how to present information to students and how to work with students of different backgrounds, abilities, and learning styles. Programs typically include a student-teaching program in which they work under a mentor teacher. The U.S. Bureau of Labor Statistics indicates that there are approximately 3,653,600 certified teachers in the United States. This occupation is expected to show an 8% growth by 2026. The median annual salary for high school teachers in 2016 was $58,030 annually. Middle school teachers earned $56,720, and elementary school teachers made $55,800. The median is that salary which half of the school teachers receive more than and half receive less. Geographic location, certification, experience, and specialization could have a significant impact on these earnings. A school teacher on the East or West coast, for example, typically receives a higher salary than one in other areas of the country. A felon can pursue any degree he or she wants. Approximately 60% of colleges consider criminal history in their admissions process, although there is no standard policy regarding a background check. Any felon that wants to get a degree so they can teach can find a college that will accept him or her. A felon may have difficulty getting accepted into some schools, but there are programs that will accept a felon. Teachers are trusted to educate and prepare children while providing for their safety. Criminal background checks are necessary for anyone wanting to become a school teacher. While minor crimes may not interfere with a felon becoming a teacher, certain criminal offenses will prevent them from being certified. Each state legislature determines which crimes are not allowable for a teacher. It is important to be honest when applying for certification as a school teacher. If a felony isn’t disclosed but is found on a background check, this constitutes fraud and is punishable. It is a crime to falsify an application which could result in being sent back to prison. In order to be successful as a teacher it is essential for felons to be honest about their background. They are already viewed with negative perceptions of being dishonest, untrustworthy, and unwilling or unable to follow directions from authority figures. Having their record expunged can give them the chance needed to begin with a clean record and succeed in becoming a school teacher. Expunging a criminal record allows anyone to honestly state on an application that he or she has not been convicted of a crime. It is a significant challenge, but it might be worth it for a felon that wants to become a school teacher. Having his or her record expunged and also documenting any training programs or additional education could make the essential difference in a felon succeeding. Spending time in a volunteer role in the educational field initially to gain experience could be essential. What do you think about this blog post? Have you or someone you know been in the situation of trying to become a school teacher with a felony? What was that like for him or her, and how did he or she achieve success? Please tell us in the comments below. I am a felon wantibg to teach again. Pleas help me out with infornatiin and plan if action.